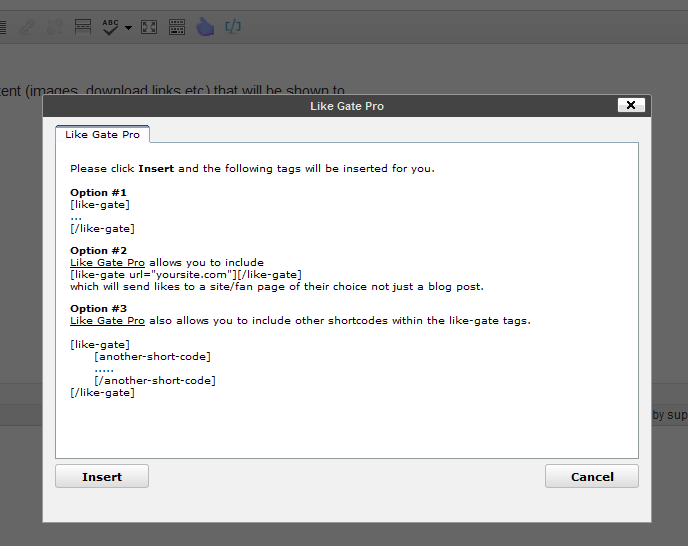 Like Gate Pro is an improved version of our free Like Gate WordPress Plugin (available on WordPress.org). It seems Share Gating is against the policy as well. We have about 80 days to come up with a solution (if possible). The plugin will remember the like status on a page when the same browser is used to visit the page (cookies are used) BUT it will NOT remember or transfer likes from your existing Facebook fan page. It is not possible without a custom Facebook app and user giving his/her permission to check their likes. Latest Version: v.1.1.7 - adds some cool fixes. Scroll to the end of you want to see the change log. 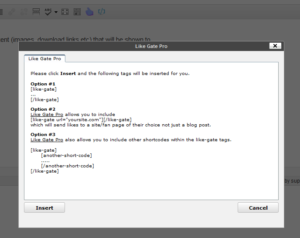 Example: you have the like gate pointing to your facebook fan page and you have included the shortcode on 2-3 pages. The plugin will remember that the person has liked the fan page and will reveal the hidden content on Page 1,2,3. Around Oct 31, 2013: we require mandatory Facebook App ID because we can't use our facebook app ID internally anymore because it can work on our domain(s) only. Update: Sept 12, 2013 - Insert the hidden text right from the richtext popup dialog no need to manually edit the shortcode. Allows you to enter an URL i.e. users can like your website, Facebook page etc. and not just a blog post. Once the plugin is installed you don't have to enable it. It's enabled by right away. This is a sample text that appears after somebody likes your article, web site or facebook page. Here you can have hidden downloads, coupon codes etc. you become a premium member you will receive updates and priority support at no additional cost. * Fixed: the content was deleted when an URL was entered. * Moved some scripts to their own folders. * Added Facebook app_id so the user can create a facebook app. * Fix: wrong article ID was inserted i.e. people will like the wrong article. * Added an option to select select a language just by clicking on it from a list. * Fixed auto updater so it doesn't always tell that there is a new version. * Added functionality to hide comment, call to action text in the settings as well. * Updated documentation files to include the info above.